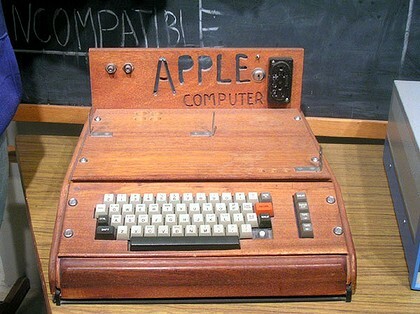 Its processor works 1000 times slower than the Apple iPad, but the first ever Apple computer has sold for 344 times the price. The Apple I, one of only 200 such models ever made, was sold Tuesday afternoon at Christie’s auction house in central London for 133,250 pounds (about $216,492). It came with its original packaging and a signed sales letter from Steve Jobs, one of Apple Computer’s co-founders and the current CEO of Apple. When the Apple I was introduced in 1976, it was the only personal computer to come with a fully assembled motherboard, making it ready to use straight from the box — provided the user supplied a keyboard, power supply, and display, Christie’s said. It sold for $US666.66 and was available until it was discontinued in 1977. Bidding on the Apple I came quickly, with the computer eventually going to Italian businessman and private collector Marco Boglione, who made his offer over the phone. Marco’s brother Francesco Boglione, who attended the auction in person, said that Marco’s purchase was a testament to his love of computers. “The first time I had heard of the idea of a personal computer, it was from Marco,” Boglione said. He bought it “because he loves computers”. Present at the technology auction, which also included manuscripts, prints, and science-themed texts, was Apple Computer co-founder Steve Wozniak, who agreed to add an autographed letter to the lot. He said the auction was an historic moment for his work, especially when sold alongside such other technological greats as an Enigma, the German code-making machine, and writings of British mathematician Alan Turing, considered one of the founders of modern computing. “I’m very delighted for the gentleman who purchased it,” he added. Boglione said his brother’s newly purchased Apple I would likely be returned to working condition — and eventually join a collection of Apple computers. Inside the auction house Tuesday afternoon, many patrons studied the sale catalog using Apple’s iPads and iPhones — a sign of the times, said Christie’s Julian Wilson.